Obtaining quality recordings during an interview process is vital, and all recordings should be clear, intelligible, and free from muddy sound, echoes, and reverberation. This is especially true when clear recordings are necessary for court proceedings. Furthermore, privacy issues arise when sound is easily transferred outside of the interview space. 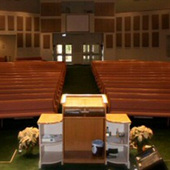 Extra steps may be necessary to ensure that what is said in the room, stays in the room. A common solution to help prevent sound from leaving the room is to work within the wall itself. Using Quiet Glue Pro or Green Glue Noiseproofing Compound between layers of drywall is an inexpensive and easy way to greatly reduce noise transmission. These products are applied at a rate of 2 tubes per 4x8 sheet of drywall. To improve sound within the room, obtain clearer recordings, and improve intelligibility, the acoustical applications should be applied to walls and/or ceilings. 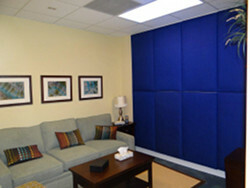 Using Acoustic Panels on the walls or as ceiling applications will absorb echo and reduce reverberation within the room. For child and family friendly centers, our Art Acoustic Panels can use any image, photo, or design to help create warm, non-threatening environments. Alternatively, simply incorporate a range of colors from our unique fabrics.